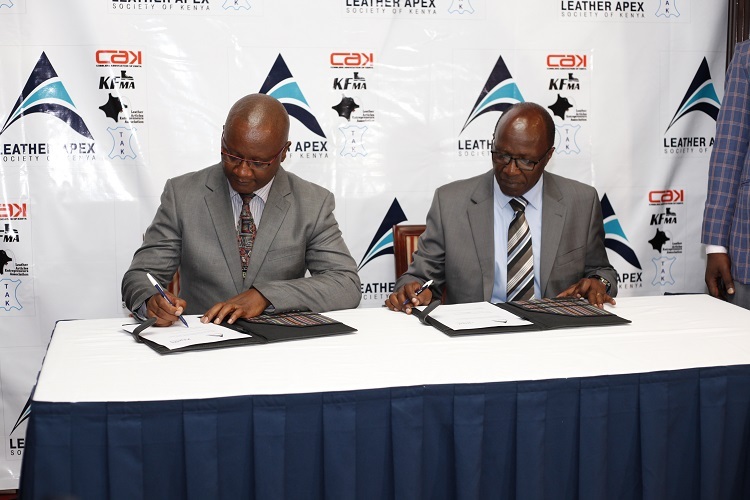 Kenya leather sector stakeholders announced the launch of Leather Apex Society of Kenya (LASK) – an umbrella body that brings together associations across the leather value chain in Kenya so as to promote efficiency, towards global competitiveness of the leather industry. Today, the Society holds under its umbrella five key national associations namely: Tanners Association of Kenya (TAK); Leather Articles Entrepreneurs Association (LAEA), Kenya Footwear Manufacturers Association (KFMA); Cobblers Association of Kenya and the Hides and Skins Association. Affiliate members from support institutions that include development agencies and academia are embraced. ‘Leather Apex has been formed to promote efficiency across the leather value chain. Our core objective is to enhance the global competitiveness of the leather industry by fostering a synergistic approach across the leather value chain in addressing capability challenges, developing business opportunities and to advocate for the development of a favorable business environment.’ – stated the Founder/ S.G of Leather Apex Society of Kenya, Ms. Beatrice K. M. Mwasi during the launch. Leather Apex, therefore, embodies a national vision of a globally competitive leather industry achieved through harnessing the collective potential of leather associations across the leather value chain. This, the industry believes, will foster the development of unique capabilities necessary for an efficient value chain. Only then can the industry excel in exploiting opportunities available to the industry locally, regionally and internationally. On 12th December 2017, the President, his Excellency Uhuru Kenyatta, announced the Big4Agenda that outlines four pillars of his administration: Enhancing manufacturing, food security, affordable housing, and universal health care. He earmarked the leather subsector as a key focus area to grow the manufacturing sector and to boost the country’s overall economic growth. In the leather industry, the president targets production of 20 million leather shoes by 2022 and increase export revenue in the industry to KES 50 billion in the next 5 years. Other opportunities available to the leather sub-sector are those contained in the presidential directive to supply footwear and other leather goods to disciplined forces under an active presidential directive. This is in addition to unexploited opportunities to export finished leather products through bilateral and multilateral trade agreements between Kenya and other countries such as AGOA, ACP/EU, EAC, COMESA and now the move towards AfCFTA. Unfortunately, the leather industry has been slow in the uptake of available opportunities due to a number of challenges it faces, among them: the “ highly fragmented structure of the Kenyan leather industry, limited linkages among stakeholders, and lack of a coherent and shared competitiveness strategy by the private sector, government, and other institutions” (World Bank 2015). Other challenges include: Low recovery and poor quality hides and skins; A weak support-industries base leading to poor quality or high cost imported fittings and accessories; Limited capabilities to value-add and optimize the value chain; Limited horizontal and to an extend vertical integration; Weak & underdeveloped SMEs sector that is unable to exploit economies of scale; Low productivity and quality due to application of rudimental technology; High cost of production; Dumping of imported cheap footwear and leather goods at extremely low prices etc. It’s in recognition of these challenges that the Leather Apex Society has been formed to foster a synergistic approach in the leather value chain in addressing the challenges, developing business opportunities and advocating for a favorable business environment, so as to better exploit available opportunities and becoming globally competitive. This formation is, therefore, a critical move in facilitating the leather industry to claiming a decent share of the growing global leather market that is estimated at $120 billion a year, where Kenya remains a marginal player with a paltry 0.14% share. This is in spite of the country holding the third largest livestock population in Africa. With such a solid raw base, the growing demand for leather goods that outweighs supply and the earmarking of the leather industry by the Kenyan government as a key sector – there has never been a better time than now to better position the industry to increase its global market share, enhance it’s contribution to GDP from the current 0.3% and to create the much-needed employment opportunities. For this, a robust competitive strategy that comes through an efficient value chain is necessary.